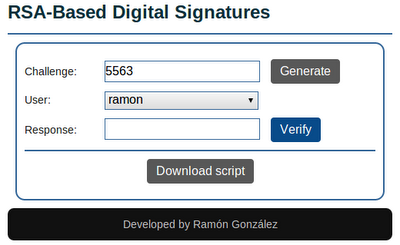 Implement a HTTP public-key repository for key exchange that employs RSA-based digital signatures. Imagine that you are in a Facebook chat, and you are talking with Alice. Then Alice start talking with you but saying strange things, so you aren't sure if is the real Alice. Now you want to verify if is Alice or not, so you send a challenge in the chat. Previously Alice, created a private and a public key for the RSA algorithm, and she is registered in a web service where the public key is stored. Then you enter to the web service, send the challenge showed to Alice. Alice use the script provided in the same web service. In the script she write the x (challenge), her d, and her n. The script returns a response. Alice send the response of the script to you via Facebook chat. You write the response in the web service and click in the verify button. The web service show if is the correct Alice or not. When the client don't write the response and click verify. When the client write a text instead of a number in the response field. I test my app with Juan Espinosa. 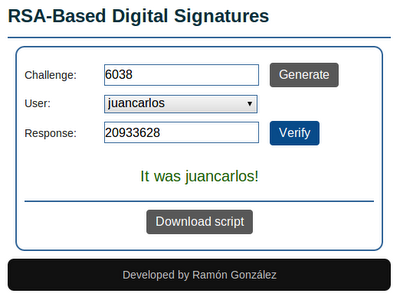 And I verify if was the real Juan Espinosa, and was correct.